Sometimes too much success can be a bad thing. Now, before you think I’ve gone all socialist on you, hear me out. Good barbeque, like real good barbeque, is almost always found at some family-run roadside joint like Virgie’s in Houston. Brisket and racks of ribs are slow-smoked over mesquite for hours out back. One batch at a time. That’s how great barbeque is done. This isn’t McDonalds or Cracker Barrel. These places aren’t designed for busloads of tourists pulling off the interstate for preheated, ready-to-serve fast food. 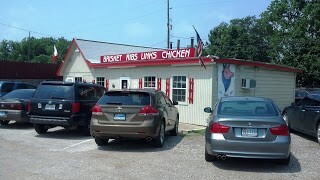 That’s why I always get suspicious when a mom and pop restaurant says they offer catering, as Virgie’s does on the sign out front. You can either serve mouthwatering home-cooked food to a small, but loyal clientele, or you can serve mass-produced food to the masses. Few can do both well. 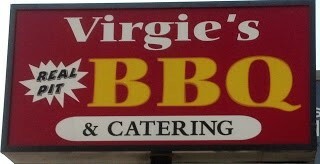 Unfortunately the day I happened to stumble into Virgie’s, this little barbeque joint on the northwest side of Houston was facing just such trial by fire. 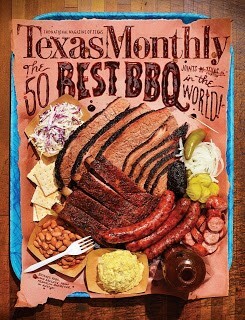 Unbeknownst to me, Texas Monthly magazine had just released its twice-per-decade list of the top 50 Lone Star state barbeque joints just a couple of days before. And, yes, Virgie’s made the list. Now, you have to understand that the publication of this list is anticipated in Texas like it’s the Sports Illustrated Swimsuit Issue. 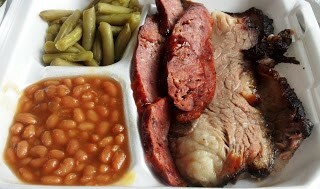 To a Texan, a list of the top 50 barbeque joints in Texas might as well be the top 50 barbeque joints on planet earth. It’s basically the same thing to them. And Texas Monthly takes this responsibility seriously. 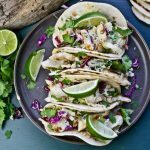 Sixteen barbeque experts go out across the 268,000 square miles of the Lone Star state and sample smoked meats at over 650 restaurants. I mean, this is serious like a sausage-induced heart attack. As I approached the front door, the freshly laminated Texas Monthly review of Virgie’s best-in-Texas brisket was proudly displayed. I had time to read it because the line at 11am on a Friday was already out the door. The gravel parking lot was so packed, I had to illegally park my rental car. The family running Virgie’s seemed a bit overwhelmed by this newfound fame and the hordes of people suddenly pouring into their little joint. The line moved fairly quickly, but there was a general sense of disorder when I got to the ladies taking down non-stop orders. But although they were frenzied, they were still very friendly. My next challenge was finding a place to sit in this cozy little lunch room. Fortunately, I spied one lone dirty table in the back. Clearly, Virgie’s wasn’t prepared for the influx of business. After I wiped down my table, I waited for my order. After a half an hour, I started to worry that I was going to miss my flight home out of Houston Intercontinental. Finally, some guy came out of the kitchen, cut through the chaos, and delivered a Styrofoam box to my table. He mumbled something about sauce and then disappeared. Assuming he would reappear momentarily with some kind of sauce, I waited. After another five minutes, I got up, worked my way through the crowd, back to the ladies at the counter, and managed to get some sauce. 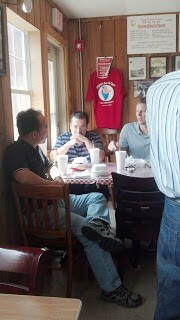 And the meat needed that sauce, which is considered a badge of dishonor in the Lone Star state. 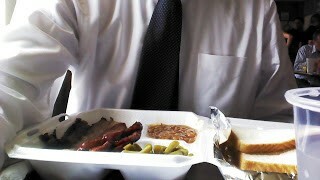 The “best brisket in Texas” don’t need no sauce. And somehow, even though their brisket had as much fat as meat, it still managed to be dry and lack that deep smoky flavor. The sausage was better, but not spectacular. The baked beans and green beans were about as inspiring as you’d get out of a can. I wolfed down my lunch in five minutes and couldn’t help feeling a little let down. Maybe the sudden success had spoiled the mojo that made Virgie’s famous. Maybe my expectations were just too high after learning about Virgie’s making Texas Monthly’s top 50. Maybe I should just come back another day when Virgie’s isn’t so overwhelmed with demand. So in conclusion, can too much success really be a bad thing? Well, all I know is that they say success has a thousand fathers and defeat is an orphan. Too bad all those hungry fathers had to show up on the same day.